Savages lose a mark for slightly mushy sound on the denser cuts, but as half-hour, pre-debut sets go, the UK post-punks' second Toronto show in two days could scarcely be bettered; afterwards, at least one support band-member could be overheard claiming, in light of the event, that they're giving up music. An initially receptive crowd grew increasingly transfixed by denim-jacketed singer Jehnny Beth's fiercely sexual manner: her gym-instructor tautness, fists-clenched intensity and seductive death stare, which could halt or start a riot, depending on context. As the icy laser riff of "She Will'' whirred up, the mobile crowd squealed like undercurrents in a tornado. "Husbands" raised the bar once more, temporarily transposing us to a sonic universe without jobs, houses, parents, cats or children. In the dying squall of feedback, a visibly emotional stranger turned round and pulled a face. "Are they like your new favourite band?" asked another. "They're like my new favourite band." 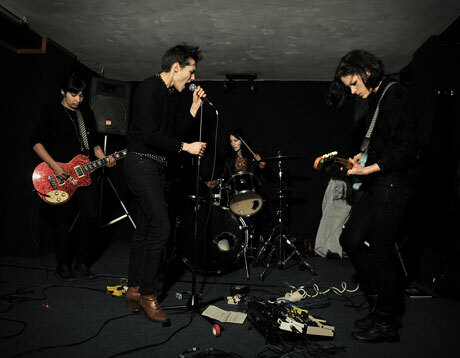 By the yardstick of Savages, we can measure precisely what live music is capable of.